The legendary heffalump makes its first appearance in Pooh's Heffalump Movie, a whisper-thin movie that will enchant children, and thankfully, not drive adults too insane. Wrapped up in the story is a moral about tolerance and appreciating the differences that everybody has, a nice diversity-minded message for a politically correct time. The biggest gripe about this film is that it is only a little more than an hour long. Like The Tigger Movie and Piglet's Big Movie, Pooh's Heffalump Movie would look equally fine on video or DVD as it does on the big screen. There is little difference, and with the minimal running time of this one, it almost belongs more at home than in the theater. The flipside is that children, the intended audience, will be more likely to sit through the entire film without fidgeting. Strange noises are bothering everybody in the Hundred Acre Wood, and Pooh (voiced by Jim Cummings, Piglet's Big Movie, The Jungle Book 2), Tigger (Cummings again), Piglet (voiced by John Fiedler, Piglet's Big Movie, The Tigger Movie), Rabbit (voiced by Ken Samson, Piglet's Big Movie, The Tigger Movie), and Eeyore (voiced by Peter Cullen, Piglet's Big Movie, The Tigger Movie) decide to mount an expedition to catch the big and scary heffalump. 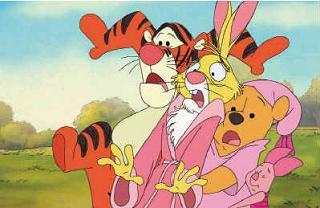 Roo (voiced by Nikita Hopkins, Piglet's Big Movie, The Tigger Movie) wants to go too, but the others feel he is too young, and the mission is too dangerous. Undaunted, Roo sets out himself, and soon meets Lumpy (voiced by Kyle Stanger). Because of all of his expectations on how a heffalump acts, Roo was terrified. At the same time, Lumpy had the same misconceptions about Roo and everybody else in the Hundred Acre Wood. As the two get to know each other, they find that they are really similar and it's wrong to prejudge people based on rumors. It's a nice moral, and director Frank Nissen and screenwriters Brian Hohlfield (Piglet's Big Movie, He Said, She Said) and Evan Spiliotopoulos (The Lion King 1 1/2, The Jungle Book 2) conform to all standards one would expect in the A.A. Milne's Pooh universe. Carly Simon even returns to add some songs that are nice, but a bit on the bland side. One could say the same about the rest of the film. It's not great, and it's not bad, it just...¦is. 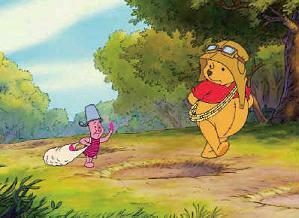 Pooh's Heffalump Movie is better than most kids movies in that it doesn't rely on toilet humor. Nissen is not trying to be edgy in any way, he just wants to make a nice small film about Milne's characters. It has a timeless feel to it, aided undoubtedly by the lack of computer animation. It's not a classic, but certainly better than some of the other animated fare that Disney releases. 1 hour, 8 minutes, Rated G.